Karl Polanyi's The Great Transformation is generally acclaimed as being among the most influential works of economic history in the twentieth century, and remains as vital in the current historical conjuncture as it was in his own. In its critique of nineteenth-century "market fundamentalism" it reads as a warning to our own neoliberal age, and is widely touted as a prophetic guidebook for those who aspire to understand the causes and dynamics of global economic turbulence at the end of the 2000s. Karl Polanyi: The Limits of the Market is the first comprehensive introduction to Polanyi's ideas and legacy. It assesses not only the texts for which he is famous – prepared during his spells in American academia – but also his journalistic articles written in his first exile in Vienna, and lectures and pamphlets from his second exile, in Britain. It provides a detailed critical analysis of The Great Transformation, but also surveys Polanyi’s seminal writings in economic anthropology, the economic history of ancient and archaic societies, and political and economic theory. Its primary source base includes interviews with Polanyi's daughter, Kari Polanyi-Levitt, as well as the entire compass of his own published and unpublished writings in English and German. This engaging and accessible introduction to Polanyi's thinking will appeal to students and scholars across the social sciences, providing a refreshing perspective on the roots of our current economic crisis. Karl Polanyi for the neoliberal age. Individual responsibility and the quest for community. Some systemically satanic features of capitalism. From civilizational breakdown to neoliberalism. Chapter 1: The economics and ethics of socialism. Responsibility and 'overview': the socialist accounting debate. The subjugation of moral ends to economic means. Towards a synthesis of Communism and Christianity. Chapter 2: The Great Transformation. The Liberal Century: contradictions of a golden age. Birth of the market economy. Disruptive strains and the end of elasticity. The originality of The Great Transformation. Some criticisms of the conceptual framework. Some criticisms of the historical argument. Chapter 3: The descent of Economic Man. From homo œconomicus to homo communisticus. The debate scatters and dissolves. Chapter 4: Trade, markets and money in archaic societies. 'Primitive' and archaic trade, markets and money. Trade and markets in Bronze and Iron Age Greece. West Africa: Dahomey, Whydah and Tivland. Dahomey and the Tiv: evaluation and critique. From Meso-America to rural India via the Berber Highlands. Chapter 5: 'Disembedded' and 'always embedded' economies. Further adventures of a concept. Embeddedness and decommodification in the mid-twentieth century. Chapter 6: 'At the brink of a great transformation?' Neoliberalism and the countermovement today. Alternative futures: participatory planning and the mixed economy. In place of a conclusion: thoughts on the current predicament. "This is now the place to turn if one wishes to understand Polanyi's contribution, [which is] put forward with brilliance." 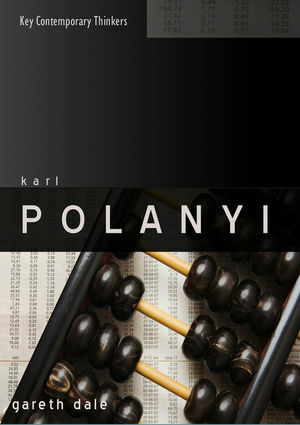 "A long-overdue comprehensive analysis of the work of Karl Polanyi. Gareth Dale's book strikes a helpful balance between a broadly sympathetic admiration for the man and his writing and careful critical analysis." "Dale has written a fine book in which his exposition and assessment of Polanyi's life's work is both highly illuminating and thoroughly convincing. It will long remain the standard authority." "A timely, complex, and thought-provoking evaluation of Karl Polanyi's significance in contemporary thought." "This book is a complex and sophisticated analysis of a complex and sophisticated thinker. It is both a fair and detailed exposition of all of Polanyi's writings and a careful evaluation of the major criticisms of Polanyi." "Gareth Dale's book is the most erudite and theoretically comprehensive account of Polanyi's ideas that I have come across. This is above all an exercise in intertextuality and is a remarkable example of intellectual dialogue." "This book will very likely become the definitive source on Polanyi's ideas and the ensuing debates. Gareth Dale combines a respectful and admiring attitude with unassailable theoretical erudition and clear-headed sobriety. Dale's extensive clarification on Polanyi also stands on its own as a serious contribution to current ideological debates and scholarly controversies regarding the prospects of post capitalist transitions." "Karl Polanyi's work is attracting ever-increasing interest. Gareth Dale has produced an invaluable guide to his writings, ranging from Political Philosophy to Economic History and Anthropology. It is well-researched and organized with a systematic review and evaluation of critiques, revealing the underlying coherence of Polanyi's world of thought."